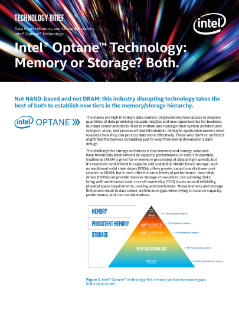 Intel® Optane™ Technology: Memory or Storage? Both. Intel is pioneering a new approach for data center architectures that close the gap between traditional memory and storage. The keystone to this approach is Intel® Optane™ technology. It's not based on NAND; rather, it's a whole new technology built on a unique architecture that allows memory cells to be individually addressed in a dense, transistor-less, stackable design.